Find hotel near Antiguo Edificio De La Ad .. The Old customs house is a cultural centre of the city and houses libraries and archives. The building looks like a classic republican colonial building with a bright yellow shade and a brilliant view of the Atlantic. The building is home to Historical Archive of Atlántico, the Pilot Library of the Caribbean, the Caribbean Pilot Library Children and the Centre for Musical Documentation Hans Federico Neuman. A stark reminder of the history of Barranquilla, the place contains about 200 years’ worth history of the city, all housed in one building. Other than that, the building’s galleries are also used for corporate events, presentations, meetings etc. Admission may depend on the exhibition. 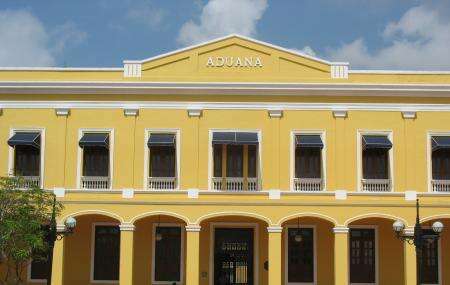 How popular is Antiguo Edificio De La Aduana? People normally club together Museo Del Caribe and Iglesia De San Nicolas De Tolentino while planning their visit to Antiguo Edificio De La Aduana. Unsurpassed quality shows and catering! Program was incredible!